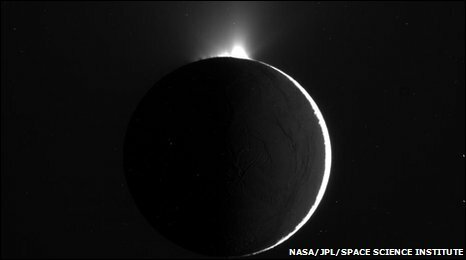 Nasa has released the latest raw images of Saturn's moon Enceladus, from the Cassini spacecraft's extended mission to the planet and its satellites. The images show the moon's rippling terrain in remarkable clarity. Cassini started transmitting uncalibrated temperature data and images during a flyby on 21 November. The data will help scientists create a highly detailed mosaic image of the southern part of the moon's Saturn-facing hemisphere, and a thermal map. 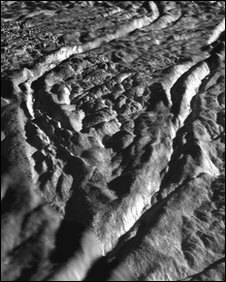 This thermal map will help researchers to study the long fractures in the south polar region of the moon's surface, which have been dubbed "tiger stripes" and are warmer than the rest of the surface. 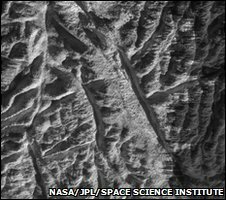 Scientists are particularly interested in these fissures because they spew out jets of water vapour, and other particles, in plumes that reach hundreds of kilometres above the surface. This flyby was scientists' last peek at the tiger stripes before the south pole fades into the darkness of winter for many years. Cassini completed its initial four-year mission to explore Saturn in June 2008. But because the spacecraft is still functioning so well, it was reprogrammed to work overtime on the Cassini Equinox Mission. The extended mission will last until late 2010. It was named after Saturn's equinox, which occurred in August 2009 - when the sun shone directly on the equator, illuminating the northern hemisphere and the rings' northern face. Saturn's orbit is so vast that Equinox happens only once every 15 Earth years. Cassini is now continuing to observe seasonal changes brought about by the changing sun angle on Saturn, its rings and its moons. 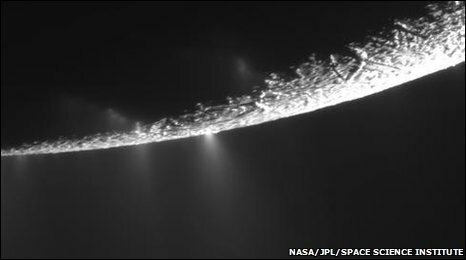 "These first raw images are spectacular, and paint an even more fascinating picture of Enceladus," said Bob Pappalardo, Cassini project scientist at Nasa's Jet Propulsion Laboratory in Pasadena, US. "The Cassini teams will be delving into the data to better understand the workings of this bizarre, active moon." This was the eighth targeted flyby of Enceladus, and brought Cassini to within about 1,600km (1,000 miles) of the moon's surface. Cassini is now cruising toward Rhea, another of the planet's moons.